A boy rushes into the home of Prem, a Global Mission pioneer. His hand is covered in a white paste, a traditional remedy his family used to reduce pain, but it hasn’t worked. Prem quickly examines the boy and promises to treat him after lunch. Today is Sabbath, and he has other patients to help before starting the church service. A man then comes in with his sick wife, who has been suffering from severe stomachaches. Drawing from his basic medical training, Prem listens to the couple and counsels them in his unusual living room. The unique space has been transformed to welcome visitors in need of medical attention. 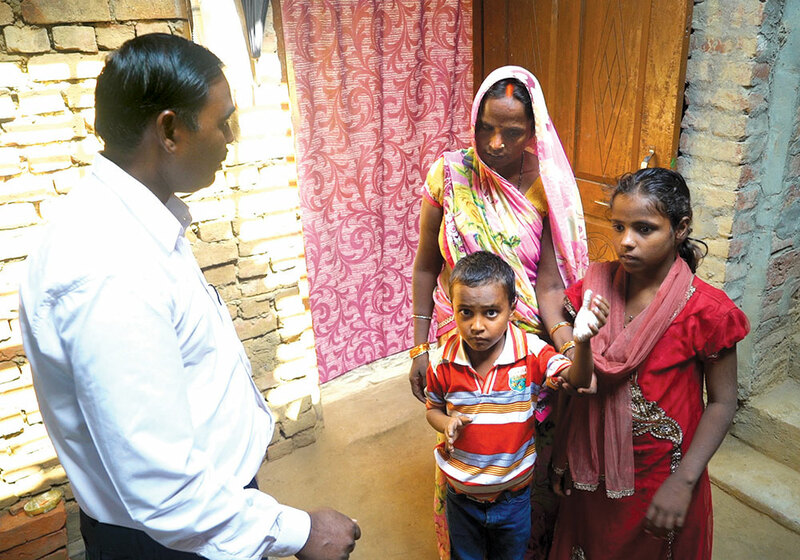 A boy’s family seeks Global Mission pioneer Prem’s help after a home remedy didn’t ease his pain. Prem counsels this couple with wholistic lifestyle principles and offers natural medicine to ease the wife’s stomachaches. 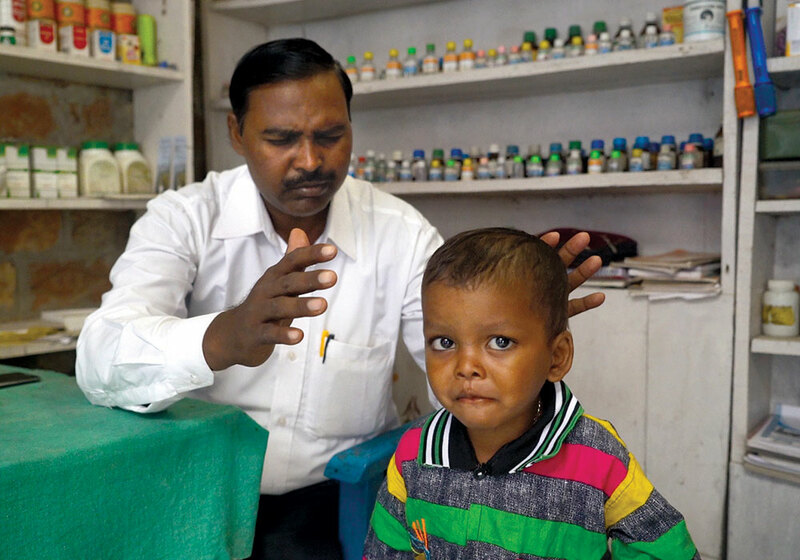 This boy first came to Prem in critical condition, but after Prem’s treatments and prayers, he was healed. The church plant members give what they can to support mission work locally and abroad. As this church plant continues to grow, the members dream of and pray for building a church of their own. 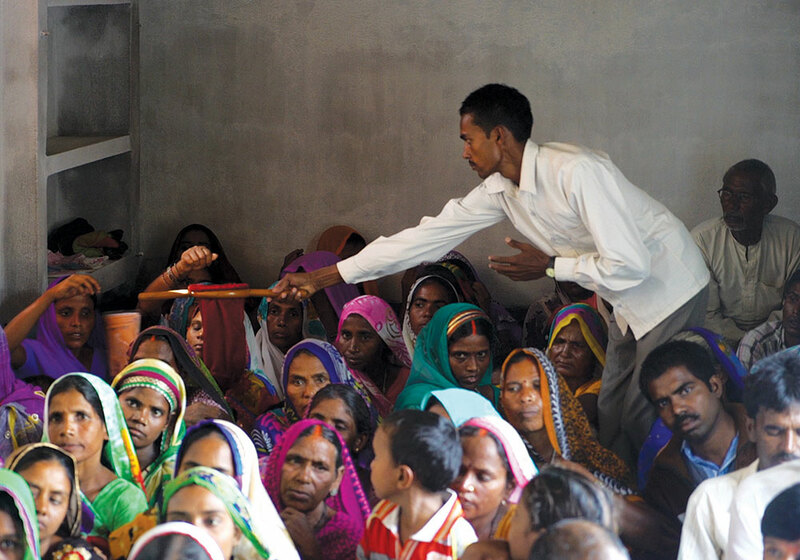 In this small town in Uttar Pradesh, India, quality health care isn’t easily accessible. Most of the people who live here can’t afford to drive to the nearest hospital, which is hours away. So pioneer Prem uses the talents God has given him to serve the town’s sick. This much-needed service is a lifeline for the people who fill Prem’s schedule each week. Prem’s patients receive more than just physical care. They learn about a wholistic lifestyle and the importance of a healthy mind, body, and spirit. They also receive love and compassion as they speak with Prem. Many of the treatments offered here are natural medicines, including herbs, plants, and charcoal pills. Prem gives this couple medication and inspirational literature. And at the end of each visit, he asks the heavenly Physician to heal and bless his patients. Prem believes it’s his duty to tell others about the source of all healing, and the people appreciate learning about the God who heals. Prem has one last patient this morning: a young boy who first came here in critical condition. 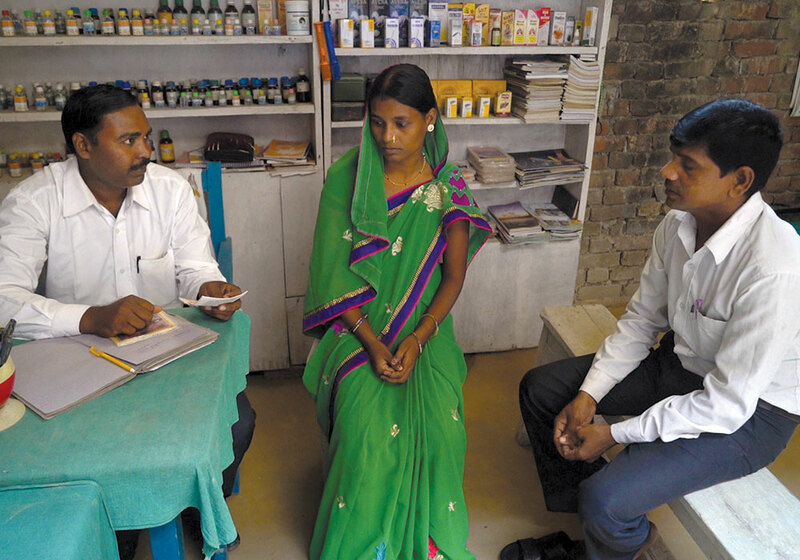 After seeing many local healers, the family’s only hope was Prem. He prayed for and treated the boy, and in time, he was healed! Today, the parents believe Prem’s God healed their son, and they continue to see Prem for their medical needs. Pioneer Prem finally gets a chance to finish getting dressed for church. At last, he rushes upstairs, where many of his former patients await him. Even from the bottom of the steps, he can hear their singing. They aren’t disturbed by the delay. The extra time has given them an opportunity to praise the wonderful God of healing they’ve come to know. Prem speaks to the group about Jesus. It’s easy for them to picture a heavenly Physician who healed, preached to, and cared for those around him. They’ve come to see a glimpse of Jesus in Prem. This church plant is the only Seventh-day Adventist congregation in the region. Before Prem arrived, this was considered an unentered area. Now, the members pray to officially establish the first Adventist church here. They also give financially to support the mission here and abroad. 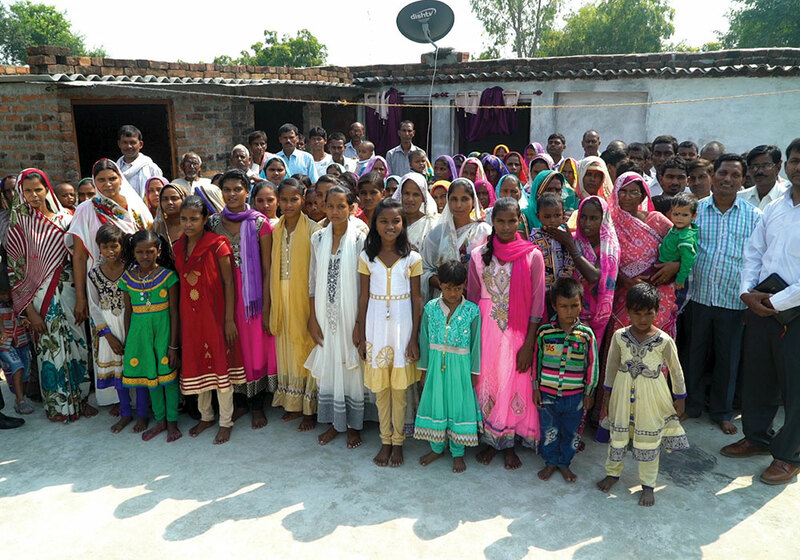 They know their humble tithes and offerings receive God’s blessing and are multiplied. Please pray for this church and for pioneers all around the world who labor on the front lines of mission work. Watch this story in action coming soon—March 16, 2019—at m360.tv/s19111. in areas or among people groups where there’s no Adventist presence. to share the good news of Jesus through wholistic ministry, such as providing medical care, teaching agricultural skills, offering literacy programs, holding evangelistic meetings, and giving Bible studies.